On any adequate characterization of what literature is, what poetry is, what a poet is, he more than qualifies. Poetry is much more than even the most heightened and felicitous arrangement of words upon a page. It exists as a quality beyond words; in a realm beyond the quotidian everyday. It exists in an unseen but proximate world to the one we conduct our daily round in. Words, arrangements of words, arrangements of music enhancing words; these are all merely means to catch poetry as it flies by. Words, words and music, sometimes fail altogether at this task. Sometimes, poetry is caught, and we know it, feel it; a heartbeat in the net of language. But the language itself is not the poetry. The attempt is never absolutely successful, because even the best constructed net is not the thing itself. It's only a means. And the poet ; they are someone who has spent a lifetime attuning themself to the presence of poetry. And to honing their skill and resources. All to the purpose of knowing when poetry is present- flying by in the air - and to catching it. A lightening rod. A weather vane. A shamen. A priestly figure who mediates between this world and that. Bob is a poet. He mediates poetry to those with ears. Those who equate poetry only with the interrelationship of words, syntax, white paper and so on, have an impoverished view of what poetry is. On an adequate view, Bob is a poet, and the work he does is poetry. He's fed and watered us with it over his and our lifetimes. We are fortunate to live in the same time frame, and he could not be a more worthy Nobel Laureate. ... including that I'm moved to tears by this moment of focus on positive human endeavour, have been going about laughing spontaneously all day, and that if i could, I'd slap him on the back, buy him a big drink, and give him my earnest and heartfelt congratulations and thanks. It was William Golding by the way. Absolutely, without any shadow of a doubt. At last the doddering old fools on the Nobel panel have got something right for once. Those who do not consider it a correct decision are just pompous, quasi-academic buffoons... self-righteous ingrate pretenders. I dance manically in the face of these faux-high brow literary snobs. It is high time that the Dylster's brilliance has been recognized by the literary world.... well done chaps... go and quaff a few port and lemons to celebrate. I was hoping you would also add something along the lines, if it were not for his Southwestern Masterpiece we probably wouldn't be having this conversation. This whole issue is elusively simple. A person deserves the prize if and only if the Nobel Committee for Literature actually gives it to them. There is no other criterion. The Nobel Committee for Literature actually gave Bob Dylan the prize. Ergo, Bob Dylan deserves the prize. Commentary: This simple argument of course does not preclude endless argument between people as to whether Bob Dylan deserves their own personal fantasy Nobel prizes, which exist in alternate universes constructed in their heads. Is literature about language or about publishing? If you're going to question the validity of this decision, then you have to question the validity of every other decision and, in fact, the validity of the Nobel system as a whole. And if that's what you're doing, then fine. But then it isn't really about Bob Dylan anymore. It's a much larger conversation. And that's fine. But as long as anyone can deserve the prize, Bob Dylan deserves by virtue of having actually won it. Maybe a meaningful distinction could be made between 'deserve' and 'entitle.' I'm not making that distinction in my argument. It you have to ask - you'll never know. Dylan can't be considered a customary selection. So there will be arguments over criteria. Can reasoning be applied to aesthetics? Can there be objectivity? Is this a sop to boomers for their popular singer rather than an effort to lift some obscure laboring page writer to instant fame? Not hard to understand the controversy even though I would agree that all these things are subjective. It's like pinning a medal in mount everest for being the highest mountain. Seems clear to me. It's a high compliment to Bob and a very clever one. Interesting, thanks for posting it. It's a beautiful line from Cohen. Cohen's line simply means that the Nobel is a statement of the obvious. What other way of taking it makes as much sense? It is, and you read the whole article hes seems sincere. Just had a horrible dream,.that the SNP's own wee nicola sturgeon was in charge of voting,.and demanded years of debate on the option of a second vote of taking bobs award away, if opinion changes!!!!! 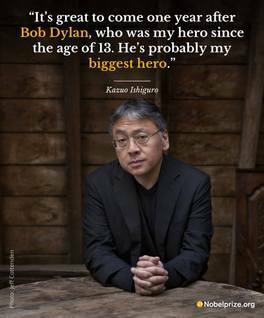 This year’s Literature Laureate, Kazuo Ishiguro, talks about his hero: Bob Dylan, who was awarded the Nobel Prize in Literature, 2016. Doesn't matter. His original stuff, and there is tons of it, stands on it's own quite well, and always will. Then you toss in the music, performances, variable renditions, etc. etc. and it's quite clear - he was kind enough to step down a notch and accept it - no wonder he took his time. And as he said - think it's easy? Try it - see how far you get. Bob DEFINITELY deserves the Nobel. More precisely, one part of his work - his lyrics, brilliant poetry set to music - deserves it, and his fans have known that for ages. The problem is that people who are not as familiar with Bob's oeuvre sometimes tend to regard him as a "poet who happens to sing his poetry and make some music, too" or simply as "Nobel Laureate" now. And I'm always like - NO No NO, HE'S SO MUCH MORE THAN A POET!!! He may be a poet, yes, but primarily he's simply Bob Dylan, greatest songwriter of all time and the greatest artist of popular culture. And a song and dance man, of course. The poll is more conclusive than the Catalan independence referendum. Let's not waste energy reinventing the wheel. Exactly, I mean how could you be a member of ER and vote for "No"?! That would make less sense than saying "I love To Kill A Mockingbird, but Harper Lee can't really write imo."